The sit stand desk was not too long ago considered an office novelty but more recently has become a permanent feature in many modern workplaces. Renowned for being the healthier alternative to traditional sedentary desks, in this article we’ll take a look at the rise of the sit stand desk (no pun intended), some of the benefits of standing while working, and also share some tips on how to best your sit stand desk. From relatively slow beginnings where senior management or colleagues with back problems were the only people deemed worthy or deserving of a sit stand desk, it has now become a must have in many workplaces across the UK. To illustrate this, many of our clients now stipulate that they would like sit stand desks for many, or in some cases, all staff. Further to this, other clients are increasingly asking about the benefits of a sit stand desk, and why they should invest in them? Nowadays, virtually all of our projects will involve a discussion about sit stand desks, while they also prove to be a very popular item when we show clients around furniture showrooms. The health benefits of using a sit stand desk are well documented, especially given the growing awareness that sitting at your desk for the vast majority of your working day is not at all recommended. Catchphrases like ‘Sitting is the new smoking’ have also gained traction and as a result, the popularity and demand for sit stand desks has risen tenfold over the past 2-3 years. Another key factor is the fact that many companies have embraced workplace wellbeing and consequently, increased movement and less sedentary work practises (more on this this later), are actively encouraged and promoted. Office design has adapted by creating workplaces that provide staff with an abundance of choice when it comes to where and how they want to work, facilitating movement throughout the workplace. 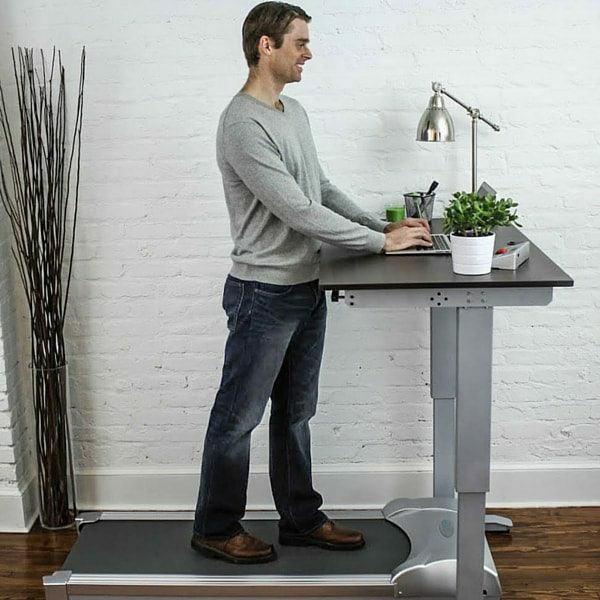 Office furniture design has followed swiftly by creating products like the sit stand desk that promote movement – not to mention the treadmill desks which haven’t quite caught on (yet). The concept of a sit stand desk has been around for some time, with salubrious individuals like Winston Churchill, Thomas Jefferson, Ernest Hemingway and Benjamin Franklin all recorded as being fans of working at tall standing tables/desks. So, it’s fair to say that the sit stand desk has been around for some time but it really started to take off and gain popularity over the past 2-3 years, as companies increasingly focused on staff wellbeing. 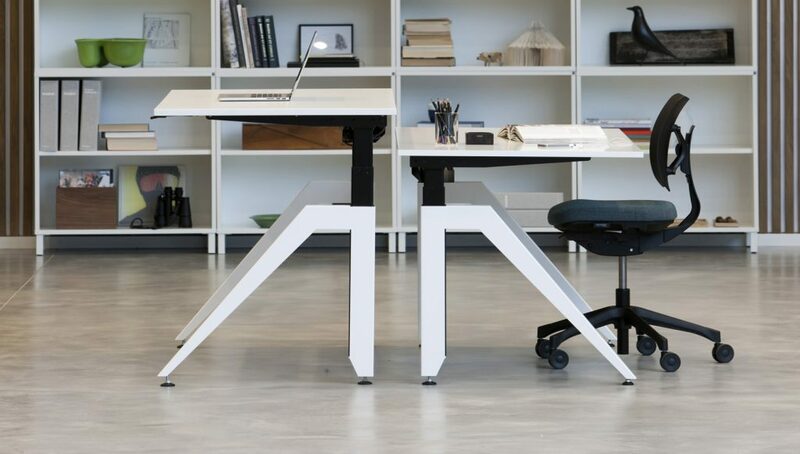 As the focus on wellbeing gained traction, the demand for sit stand desk solutions increased tenfold, and subsequently furniture manufacturers began to release an array of sit stand desk options. As product options increased, what had traditionally been high price items, became attainable for those on smaller budgets. Health experts recommend that we spend at least 2 hours per day standing or away from our desk, and that we should gradually increase this to 4 hours. 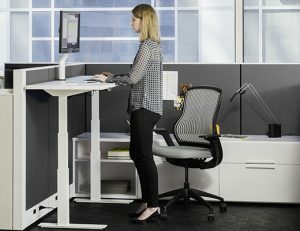 Bearing this in mind, the option of using a sit stand desk while completing a variety of work tasks should certainly facilitate a far greater degree of movement, and allied to the variety of collaboration areas in the modern workplace, there is no reason for many employees not to take the advice of the experts. Greater movement and activity levels have been cited as factors that can help to decrease blood pressure, cholesterol, stress and even forms of cancer where studies have found that increases in C-reactive protein, found in those who are seated for long periods, is a major contributory cause of certain types of cancer. One statistic that has stuck in my mind is that standing for on average 3 hours a day over the course of a year can burn as many calories as running 10 Marathons. The obesity risk is obviously reduced by standing for at least a couple of hours every day which is further highlighted by the result of a study from the Mayo Clinic where a group of office workers were asked to increase their calorie intake by 1000 calories – that’s the equivalent of 5 pints of beer or a Big Mac meal. The group were asked not to alter any exercise habits and to cut a long story short, those who regularly moved about during the day or worked while standing did not experience any great degree of weight gain. The report concludes that standing is just the beginning and that sedentary workers need to walk around a lot more, but that a sit stand desk is a good start. The New York Times writer James Vlashos sums it up nicely by stating that movement throughout the day is essential and that sitting all day and then hitting the gym makes as much sense as countering smoking by jogging regularly. Certainly food for thought and an incentive to use a sit stand desk! It’s an undeniable fact that people who spend more time sitting are at greater risk of suffering back pains and that’s still the case even with today’s ergonomic office seating and workplace assessments. Sit Stand desks can help to decrease the risk of back pain and improve posture but it’s important to make sure they are set up in the right way, ensuring that your screen should sit just above eye level to avoid having to bend or slouch while you read or type. Standing while working simply engages and improves your core strength which in turn leads to improved posture and a decrease in back pain. 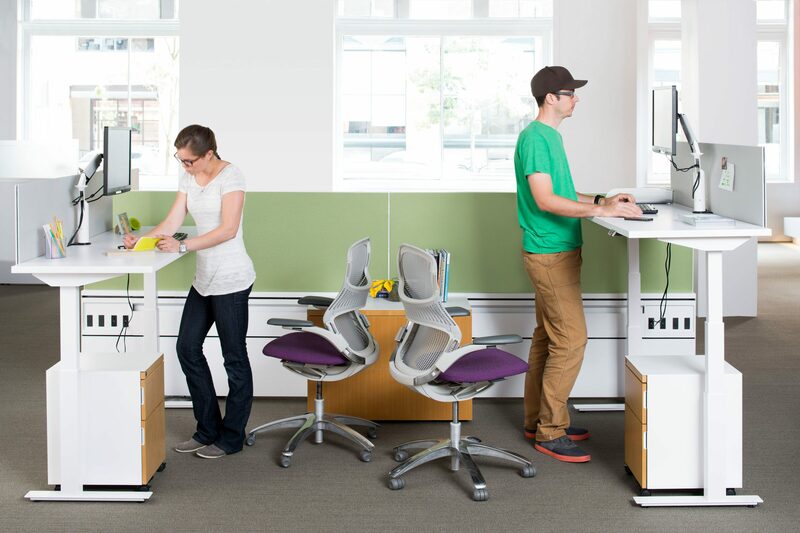 There is an argument that the wholescale adoption of sit stand desks can help to create a vibrant, dynamic and agile workplace. The prescribed logic here is that increased movement and stand up working can alter the workplace dynamic creating buzz and a more collaborative environment. In addition, people are supposedly more approachable when not seated (so we’re told) and that as a result of increased standing, there is more interaction and engagement throughout the workplace. It is also worth mentioning that it is far easier to host an impromptu meeting al desko when standing, so quick interactions are also said to increase as a result of sit stand desk usage. The K2 team certainly think that there is credence in the belief that sit stand desks can help to create a dynamic, agile workplace, but think a lot depends on the company in question, its workplace culture and also the workplace environment itself. There are further arguments that sit stand desks can result in increased creativity but we think that pretty much depends on the individual and of course the workplace. In addition, many articles we read while researching this piece referenced a reduced risk of Type 2 Diabetes and Cardiovascular disease. While it seems that there would be a likely correlation and that sit stand desks can most certainly help to promote a healthy workplace, we believe that they are one piece in a much larger lifestyle jigsaw. While there are sceptics who believe that the advantages of using a sit stand desk are overstated, we do believe it is a step in the right direction and that coupled with a desire to sit less and move more while working, is a highly recommended way of working. Essentially, we think that companies should do what they can to promote a less sedentary way of working and that sit stand desks have an important role to play in achieving this. 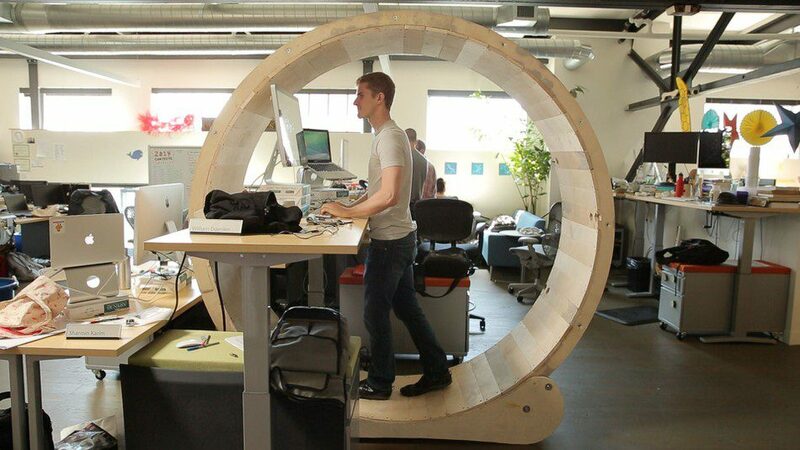 To finish, we wanted to share one of the more unique images we found when researching this piece, courtesy of Mashable – the ‘Hamster Wheel’ standing/walking desk which we love but are unsure of it practicalities and longevity. If you are interested in ordering or simply finding out more about sit stand desks, feel free to get in touch.